This afternoon I found myself back in the studio after taking a long January break. I had three necklaces to make from freshwater pearls, and it was the perfect project to help me get back into the swing of things. Each necklace was 55″ long, designed to be worn either doubled for an opera length, or tripled as a substantial choker. I usually string my necklaces starting in the middle, adding to each side and working back to the clasp. Even with an asymmetric piece it is easier for me to balance the two sides when working from the middle. I don’t tend to sketch my ideas for a necklace. Instead I do a lot of on and off with the beads until I find the design and balance I like. I did something different with today’s pearl necklaces. Working with such a long length was going to be too cumbersome to work from the middle out, so I started at the clasp end. I worked in small sections, balancing the thick and thin bits with each consecutive 2″ segment. As the necklace got longer, I would wrap it around my neck to see how the strands looked next to each other. When I needed to rework a section, I only had to remove about 4″ of beads to get the design to work out. 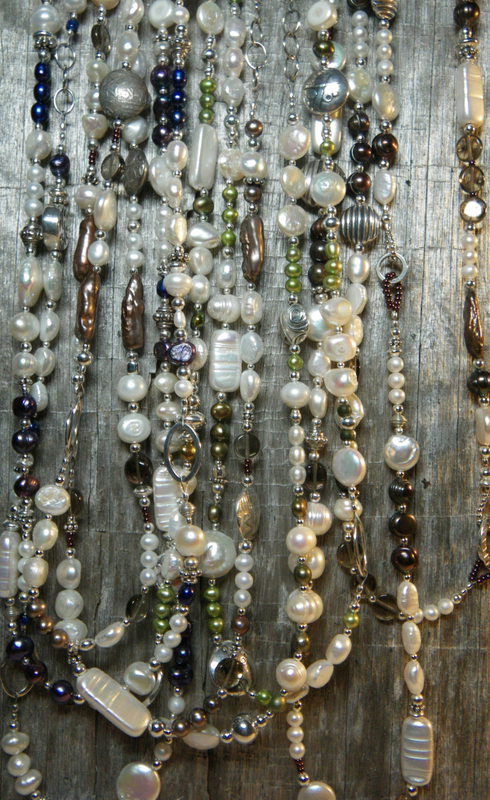 I also included short sections of silver chain, to keep the necklaces from getting too heavy, and to add contrast to the pearls. 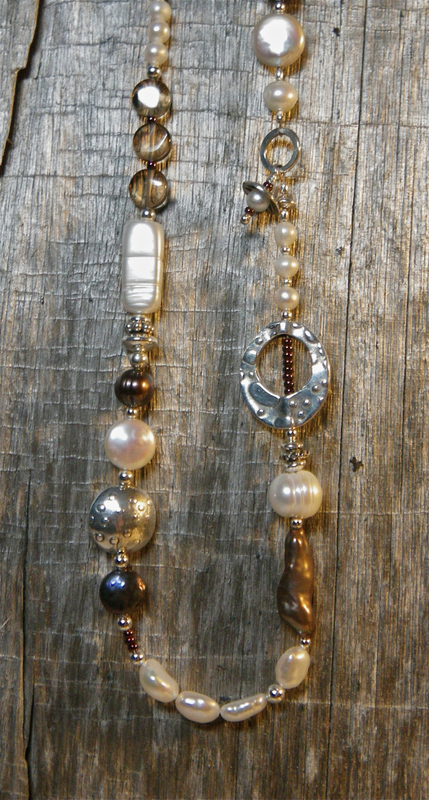 Each necklace was a combination of pearl colors, mixed with small sterling silver round beads and several handmade beads of Precious Metal Clay. One featured whites with greens, the second featured whites with purples and blues, and the third featured whites with taupe and coppery hues. At a holiday craft fair in December, a customer asked me what was the difference between a freshwater pearl and a salt water pearl? I stood there looking like an idiot because the only answer I could come up with was “price.” I did not want to say that they are a lot cheaper, even though they are. (It’s not a good idea to use any version of the word “cheap” when trying to sell your jewelry!) I like to know about the components I use in my jewelry, and I felt negligent that I did not have a good answer about freshwater pearls. Freshwater pearls grow in freshwater mussels as opposed to saltwater pearls that grow in a certain kind of oyster. Both the mussels and oysters can be farmed, but one mussel may produce up to 10 pearls while each oyster only produces one. The mussels can be cultivated in many different climates, whereas the pearl oysters need warm water. You can see why the freshwater pearl is a less expensive alternative to the cultured pearl, and yet they have the beautiful glow one looks for in a pearl. DANG…that’s good information! i’ve always wondered myself…. DANG! It’s good to hear someone use the word Dang! I would say it’s just as good as knowing that freshwater pearls come from mussels and salt water pearls come from oysters! These are just lovely! 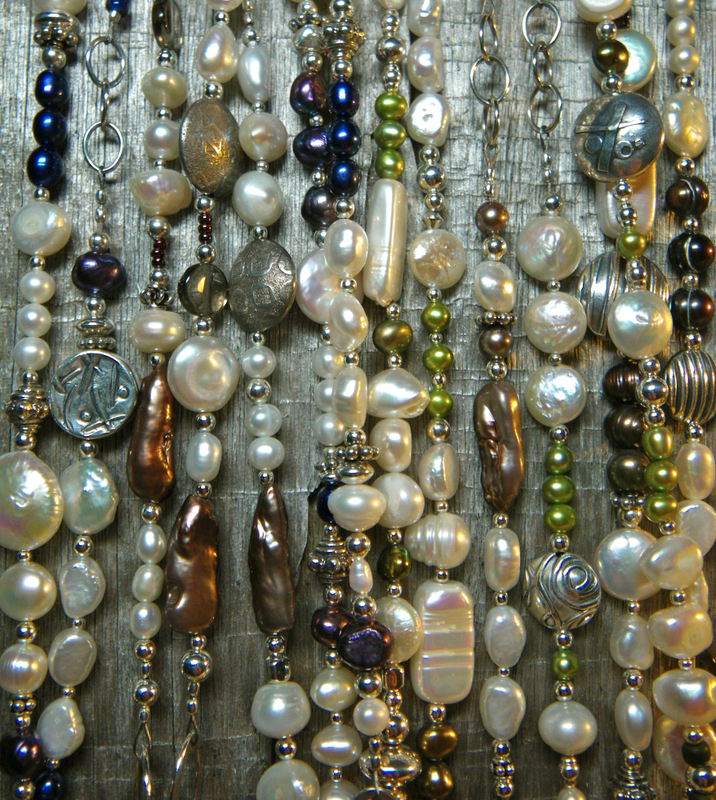 I love pearls and they look great with your metal clay beads. Let me know if you ever decide to sell any of your beads. I like them so much better than most beads I’ve seen. And of course you’d be credited. I promise you will be one of the first to know if/when I sell beads! I do so much of my own bead shopping on Etsy, that I did start another Etsy shop just for beads, in case I ever sell my own. I don’t have anything listed there for sale, but the plan is one step closer…. Lovely necklaces and thanks for the info on pearls. I never knew what the difference was either. Thanks, Susan. It was embarrassing not to know the difference, before! You ready for another snowstorm tomorrow? I’m supposed to be driving to Portsmouth with Brenda, my sister in law. We’ll see what happens in the a.m.